US Ambassador to the UN accuses Russia of failing to abide by humanitarian ceasefire in Syria, resulting in civilian deaths in Ghouta. US Ambassador to the UN Nikki Haley criticized Russia for failing to abide by a UN ceasefire in Syria Monday. “Sixteen days ago, we came to an agreement. Russia cast its vote in favor of the agreement. 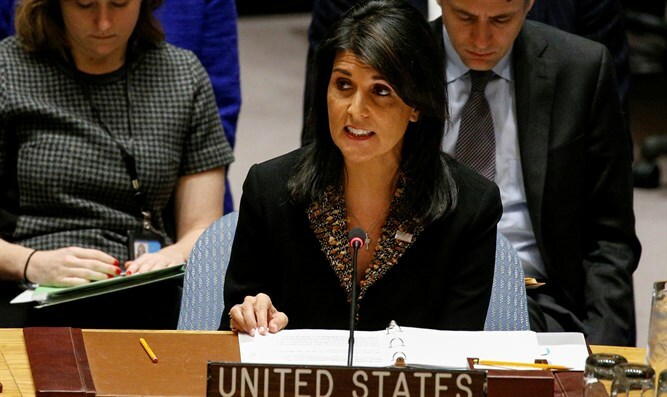 And with that vote, Russia promised its support for a 30-day ceasefire, as did the rest of the members of the Security Council," Ambassador Haley said at a UN Security Council briefing Monday. “During the negotiations, the United States put all parties on notice that we needed to act if the ceasefire was not honored, and members of the Security Council agreed. And now that day has come. The ceasefire has failed. The situation of the civilians in eastern Ghouta is dire. And the United States is acting. We have drafted a new ceasefire resolution that provides no room for evasion. It is simple, straightforward, and binding. It will take effect immediately upon adoption by this Council," she added. Earlier, the White House accused Russia of complicity in human rights violations by the Assad regime in eastern Ghouta. Russia began military operations in Syria in 2015 to bolster the Assad regime and has ruled out the possibility that Syrian President Bashar al-Assad would step down as part of a solution to the country's civil war, which has claimed over half a million lives, the Syrian Observatory for Human Rights reported Monday.